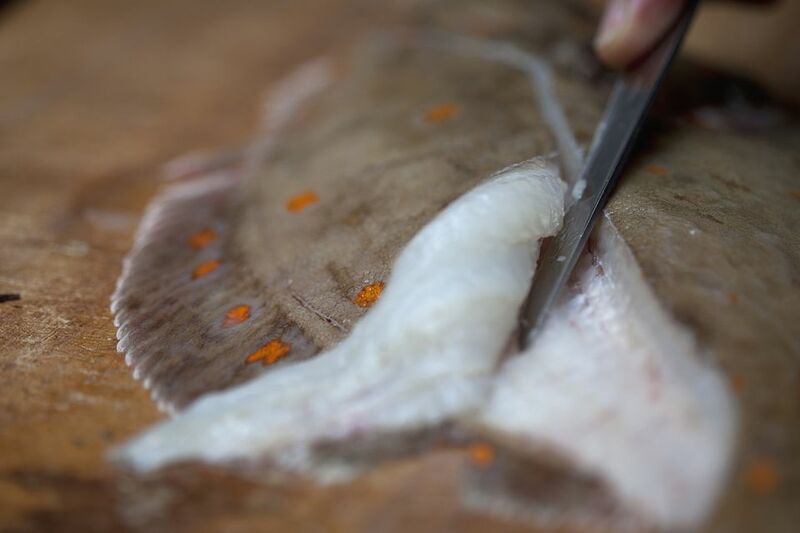 Filleting a flatfish is similar to filleting a roundfish, but there are just enough differences to warrant this step-by-step. Done right, you can leave a carcass with very little meat on it. First, set up your workstation. You should have plenty of room to maneuver, a stout cutting board, a fillet knife or a boning knife with a very flexible blade, a bowl for the fillets, a bowl for the carcass, and a cleaver -- although the cleaver is optional. 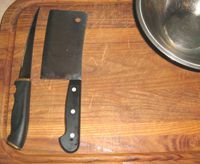 The cleaver and the carcass bowl are in case you plan on saving it to make stock with later. This is something I highly recommend, as the bones and heads ​of all flatfish make superior stock. Now you place the fish down on the board. Always place the fish's head where you can anchor it with your "off," or non-cutting hand. Now keep in mind there are many ways to fillet a flatfish; many people will start from the tail end. Either way, you need to anchor the fish with your off hand. Now you make your first cut with your fillet knife. It should always be at an angle from just behind the head on the "back" side, meaning the side without the guts. Doing this gets you a little more meat. Take that cut down through to the tail. Be sure you are not cutting through the backbone. You want to cut over the backbone. The way to do this is to slice down on this first cut, then turn the knife toward the fish's tail and slide it over the backbone. Now you can remove the guts. This is one of the few waste products of a filleted fish -- unless the fish has eggs, called roe. If you find the orange sacs of roe in your fish, remove them gently, wash them and fry them with a little flour in bacon fat. You remove the guts by cutting in the arc of the back of the fish's paunch and tossing it in the trash. Use the point of your knife for this. Behead the fish. Now you could do this right at the get-go of the filleting process, but then you don't have anything to hold the fish down with when making that first cut. Those who start with the tail often remove the head and guts first. This is where you use the cleaver. Chop the head off right where you cut that first fillet. If you are going to make stock, now is the time to cut the gills out of the head. Gills are the other thing that is best thrown out -- they will make your stock bitter if you leave them in. Cut the gills out with the fillet knife; they are attached at either end by strong ligaments, but only by a thin membrane in the middle. This is an alternative way to fillet a flatfish, especially a large one -- something larger than 6 or 7 pounds. It is called a double fillet. The larger the fish, the thicker and wider the backbone is. It can grow so thick that it will rob you of precious meat if you try to use the single-fillet technique we just went through. First, make a cut with the end of your fillet knife along the backbone. Where is it? Look for a thin, straight line on the fish that curves around the gut cavity. Cut there. Now you free the meat from the bones. That is how you should think about it, freeing meat rather than slicing through it. Start at the tail end by running the fillet knife away from you (toward where the head was) on the angle of the backbone. Now you run the knife over one side of the backbone. Then you continue this process outward toward the edges of the fish, slipping the knife over the bones. It should require little or no effort, even for a large flatfish such as a halibut. Once you get to the edge, pierce the skin with the knife and free it off the carcass entirely. Now the decision: to skin or not to skin. Most people will skin their fillets because flatfish are typically cooked in either refined ways where skin would be a hindrance or fried, where it would curl up the fillet and cause it to cook poorly. The exceptions are really large flatfish such as big turbot and halibut, ​or an Atlantic fluke larger than 12 pounds. These fillets are better cooked by steaking them out into fillet steaks, with a strip of skin left on. The way to skin a fillet is to anchor it firmly at the tail end with one hand, then slipping the knife along the skin. This is where a true fillet knife earns its keep: It is far more flexible than most other blades, so you can actually maintain pressure on the knife as you cut off the skin -- the knife will bend. It can take some effort, so keep a firm hold on that tail end! All that's left is to clean up and trim your fillets. The reason you do this is not only for presentation -- which matters, by the way -- but also because the edges of the fillets must be fairly uniform otherwise it will cook poorly: The edges will dry out before the center is cooked through.